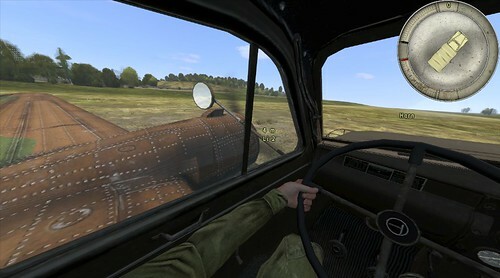 Making a Li2 a proper transport - Welcome to the Iron Front Fan Forums! This is a very primitive attempt on making the Li-2 a flyable transport plane. Attaching a studebaker neatly into the beast. It looks and feels legit when inside. No weird visual bugs. It hasn't been tested with Ai or in a server. I don't know how to modify more than one Li-2 without hundreds of scripts. So there's only one Li-2 in the download. Feel free to build on this idea. I'm sure someone with better understanding of the language can fix it. edit: Get in by aiming at a point where the wing meets the fuselage by the rear door. For Pilot you can go from back seat to pilot or use the protruding studebaker front wheel near the nose. The Li-2 itself is manned by Ai. edit: Made changes and added a small tutorial. Paradrop: Straightforward. Just make sure you're at a safe height. Extract into your editor missions folder here C:\Users\username\Documents\Iron Front\missions.